1. Who is eligible for Ontario Works? To be eligible for Ontario Works, applicants must be residents of Ontario. Eligibility for Ontario Works is based on an assessment of financial need and an agreement to participate in employment activities. Financial need is determined according to family size, income, assets, and shelter costs, and is updated as circumstances change. For example, a single person can only ha ve assets (either cash or specific items that can be easily converted to cash) valued at up to $548. For families, the asset limit is higher. Participation expectations are laid out in an agreement, which is signed by each individual applicant and updated as activities are completed or modified. The agreement includes a plan to take part in employment assistance activities that support the individual's transition to employment. Eligibility rules are designed to ensure that people turn to social assistance only when all other financial resources have been exhausted. Detailed information about eligibility for Ontario Works financial assistance and employment assistance is available in the Ontario Works directives. 2. How do I apply for Ontario Works? Call Toll-Free 1-800-667-3145 or 862-7850 to start the application process over the phone. If you are close to one of our offices it can be dropped off at the front desk for processing. Please be aware that the Noëlville office is not staffed and if you are in the Sudbury East area you would have to drop it off at the Warren office. 3. What are the current Ontario Works rates? 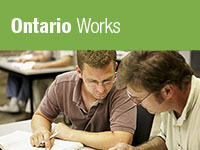 To view the current rates for Ontario Works participants click on the link below. Please keep in mind that the rates listed are all maximums and do not take into account deductions from earnings/pensions/support etc. 4. Am I required to complete a literacy screening questionnaire? All Ontario Works applicants without Grade 12 education (high school diploma) or equivalent and without proof of a learning disorder are required to complete a literacy screening questionnaire. In addition, Ontario Works participants whose reading, writing, and/or math skills appear to be a barrier to employment may be asked to complete the screening questionnaire and/or be sent for an assessment. Literacy screening and training can help people on social assistance upgrade their reading, writing and math skills so they can find and keep a job. 5. What are my Rights & Responsibilities as an Ontario Works applicant or recipient? An Interview - You may bring someone with you when you meet the Case Manager. This person can be anyone you choose. A Decision - You will be informed (in writing) of any decisions to grant, refuse, suspend or cancel your financial assistance and the reasons for making those decisions. A Chance To Have Decisions Reviewed - If you disagree with the decision made, you may make a written request within 10 days to have the decision reviewed by our local office. This internal review must be completed by our office within 10 days, and you will be told of the result. If you disagree with the internal review decision, you can make an appeal to the Social Benefits Tribunal within 30 days of the date of the internal review decision. Your Case Manager can give you information about the appeal process. You also have access to our Family Support Program which can provide you with the help you need to pursue financial support for yourself and your child(ren). Respond Promptly - Contact your Case Manager promptly if you receive a message or notice to do so. Complete and return promptly forms and documents as requested by your Case Manager. Periodic interviews will be required. Work and Participate - You must actively look for work or better paying work or participate in an approved activity that will improve your opportunities to obtain and keep employment. Obtain and Report All Available Income - You must make every reasonable effort to obtain income available from all sources, and report any income you receive. Report All Assets - You must also report all assets, that being anything that can be converted into cash (such as property, vehicle, bonds or investments). Report Your Living Arrangements and Other Changes - You must report any changes in your living arrangements such as your address, phone number, rent or housing costs, number of people in your household, etc. as and when the change is known. You also have a responsibility to participate in the Consolidated Verification Process and attend appointments as required. 6. What is the Family Support Program? This program is designed to assist parents (who are receiving assistance under Ontario Works) in obtaining the child and/or spousal support that they (and their children) may be entitled to, under the appropriate legislation and Child Support Guidelines. A little support may be all you need! With the appropriate support in place, a sole support parent who secures employment, is often no longer in need of social assistance. 7. What is the Eligibility Review Program? This program is established to investigate the eligibility of present and past applicants and recipients. Upon completion of the investigations, decisions are made regarding ongoing eligibility, overpayments or arrears and where warranted, there may be a referral to the police for legal action. To report a potential fraud allegation, please call the Provincial Welfare Fraud Control Hotline: 1-800-394-7867. 8. What is Consolidated Verification Process (CVP)? Your file will be checked to make sure that all necessary information is there. You may be asked to attend a CVP Interview and to bring any information that is needed for your file. During the CVP interview, all the information in your file will be reviewed and you will be asked about changes to your personal information. After the CVP interview, you will receive a list of any information still required for your file and this information must be provided within ten working days. Once your file review has been completed, you will be advised if there are changes to your financial assistance and/or eligibility. 9. How does Ontario Works help people on social assistance find employment? Learning, Earning and Parenting (LEAP), provides young parents who are receiving assistance through Ontario Works with the supports they need to finish high school, improve parenting skills, and achieve economic self-sufficiency. earnings exemptions and employment incentives that encourage participants move back into the workforce and off social assistance. 10. What is Interactive Voice Response – IVR? Participants can obtain cheque information for the next benefit month, by calling the IVR after the 26th of the current month. To contact the IVR, phone: 1-800-808-2268. 11. What items are included in my monthly entitlement? Basic Financial Assistance includes income assistance provided for the purposes of basic needs and shelter. The amount that you are eligible to receive depends on your family composition, ages of your children, your monthly accommodation expenses and the amount of any income that you may currently be receiving. The Basic Needs portion of your monthly entitlement is intended to cover such items as food, clothing, personal items etc. The amount of basic needs that you are entitled to receive depends on your family size and the ages of children. In addition to a Basic Needs allowance you will be issued the amount of your actual shelter costs up to the maximum allowable for your family size. Due to a maximum amount allowable for shelter it is possible that your shelter expenses will exceed the amount that you are allowed. If this is the case you should speak with your worker to discuss options that may be available to you. An amount for Board and Lodging. Accommodation expenses do not include such items as parking, cable TV, and telephone or internet access. Included with your monthly entitlement all eligible participants will automatically receive a monthly drug card that will cover the cost of most prescription drugs as well as a dental card that will cover emergency dental care for adults and basic dental care for dependent children. Also, eligible participants may receive an additional amount up to $250.00 per month for a special diet. A Special Diet Form is available from your Ontario Works Case Manager a medical practitioner must complete the form indicating that the diet is required for health related reasons. 12. How do I complete and Income Reporting Statement (IRS)? An Income Reporting Statement or IRS must be submitted each month on the 16th in order to receive assistance for the next month. If the IRS is not completed properly it will be returned to you for completion, this may result in your assistance being late. If IRS's are not input by a certain date each month (around the 21st) your cheque will be held and mailed on the date of the cheque (either the 1st of the following month or the last day of the current month). If your assistance is deposited into your account and your IRS is received after the 21st the system will generate a cheque. In order to receive your assistance on time and in your account if using direct deposit you must ensure that it is completed properly and received by your local office no later than the 21st of each month. We have included some examples below to help you fill out your IRS. 13. How is my Ontario Works assistance paid out to me? If you are eligible for Ontario Works assistance you will either receive a cheque or you can agree to have your assistance deposited directly into your bank account. If you wish to have your assistance deposited into your bank account you will be required to provide your Case Manager with a personal cheque marked "void" or if you do not have a bank account with cheque writing privileges your Case Manager will provide you with a form to be completed by your bank. You must be one of the registered account holders. You may not use another person's account. Funds are deposited into your account at 12:01 am on the payment due date. You will receive a statement in the mail that will consist of the same 4 parts as a cheque with the exception of the cheque portion. The Statement of Direct Deposit will replace the cheque portion and is similar to a cheque in appearance. However, in the bottom right corner it will read "Non-Negotiable". Creditors may attempt to recover outstanding debts from funds in your account. If you have concerns in this regard please contact your Case Manager. Notify your Case Manager immediately if you change or wish to close your bank account and provide your Case Manager with your new bank information. If you are wishing to close your account do not do so until after your direct deposit arrives at your new account. 14. What other Benefits might I be eligible for? If you or a member of your benefit unit requires any of the mandatory benefits listed above please speak with your case manager. If you or a member of your benefit unit requires any of the discretionary benefits listed above please speak with your Case Manager. Please note that in order for Ontario Works to assist with the requested item you must receive approval prior to purchasing the item. Ontario Works cannot reimburse monies for discretionary benefits purchased without prior approval. If you or any adult member of your benefit unit requires any of the above items please contact your Case Manager. 15. Are there any other Government Programs that I might be eligible for? Our office usually carries a supply of various Government forms or you can check the following websites. The following link will take you to the current Social Assistance, Pension and Tax Credit Rates. It contains information regarding other income you may be eligible for. 16. If I have a job how much of my income is deducted from my assistance? The exemption rate on employment income or amounts paid under a training program is 50%. This means that no matter how much someone earns, only half of the employment income is deducted from their Ontario Works financial assistance. This exemption only applies in the 4th month of assistance after you have been on assistance for 3 consecutive months. 17. What do I do if I can't make my appointment? Contact the Ontario Works office immediately to advise and re-schedule. 18. I received a letter saying that my assistance has been suspended. What should I do? The letter will outline the reason for your assistance being suspended. You will need to address the reason(s) as outlined. If you need more information about the suspension, contact your Ontario Works Case Manager. 19. If my assistance is currently suspended do I still need to send in my Income Reporting Statement? Yes, always send in your Income Reporting Statement to ensure continued assistance once the suspension has been lifted. 20. What do I do if I get a job and no longer require assistance? Please contact OW and advise us of your employment. This is important information. You may also be eligible for some additional financial supports to help you get started in your new job. 21. What period of time does the Income Reporting Statement cover? Any time a client does not agree with a decision made by the Ontario Works Case Manager, a request for an Internal Review may be made by putting the request in writing within ten (10) days of the original decision. The decision is then reviewed by a Case Presenting Officer and a further decision is made and this decision is put in writing to the client within ten (10) days. If the client still does not agree with the decision, then an appeal may be made to the Social Benefits Tribunal (SBT) and a request may also be made for interim assistance pending the decision of the SBT. If the client loses the appeal, then any interim assistance paid to the client must be repaid. 22. What if I plan on leaving the province? When receiving Ontario Works financial assistance from the province of Ontario, you must remain in Ontario. You may leave for up to seven days provided you continue to meet your job search efforts. If you are absent from Ontario for more than seven days, your cheque may be reduced. Please speak to your worker before leaving the province. 23. How can I pay for daycare if I get a job? If you require child care, please speak to your Case Manager. You may be eligible for funding for informal child care or for the licensed child care subsidy program. Manitoulin-Sudbury DSB provides subsidy for child care in a licensed centre (or home) to those who financially qualify. Subsidies can be provided to employed single or two parent families or to those who wish to access academic upgrading. Subsidies may also be available for children with special needs and socially disadvantaged children when referred by a third party. Child care requirements should never be a barrier to employment. Please speak to your Case Manager.